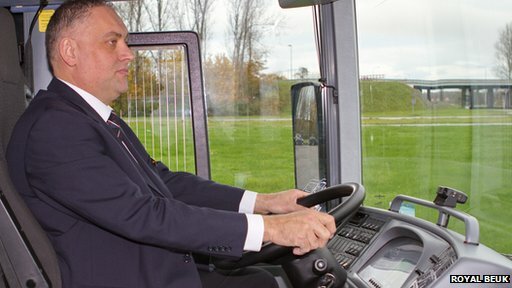 Coach drivers' eye movements and blinks are to be tracked by computers as part of a test to see whether the tech could be used to prevent accidents on long distance trips. Five firms have each fitted the product to two coaches as part of a trial taking place across continental Europe. Seeing Machines' Fatigue Monitoring System is already used by miners. However, one expert cautioned it was unclear whether it would improve safety in the coach industry. 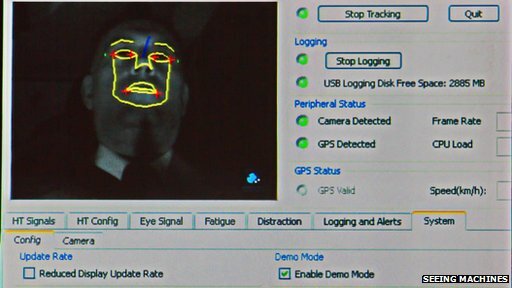 The Australian firm's product uses special cameras installed inside a vehicle to monitor the driver's gaze. If it detects they are distracted or taking "microsleeps" - naps that can last less than a second and take place without the person's knowledge - it activates a vibration motor built into their seat. In addition it triggers an alarm in the co-driver's sleeping compartment to alert them to the fact they should take over control of the vehicle. The patented technology uses invisible infrared light to detect the driver's eyes in the dark without distracting them, and can be used even if they are wearing glasses. Seeing Machines' chief executive suggested the system could detect the risk of an accident at an earlier point than alternative products such as lane detection cameras and steering wheel monitoring sensors. "Coach accidents aren't that frequent, but when they do happen they are so catastrophic that they make the [newspaper] front pages and in a lot of cases it is almost the end of the coach company involved as no-one wants to ride with them anymore," Ken Kroeger told the BBC. "The way the technology works is that it tracks your head position and your eye aperture. "If you turn your head beyond a certain angle for a specified duration while moving over a certain speed, it will remind you your eyes should be on the road. "Then for fatigue it looks at the frequency of blinking, the velocity of the eyelid when it's opening and the duration of the eye closure to determine if it's a microsleep." 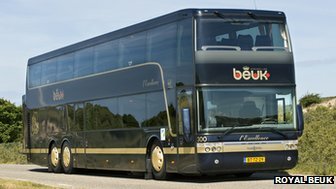 Seeing Machines has teamed up with the coach operator Royal Beuk to hold the trial. 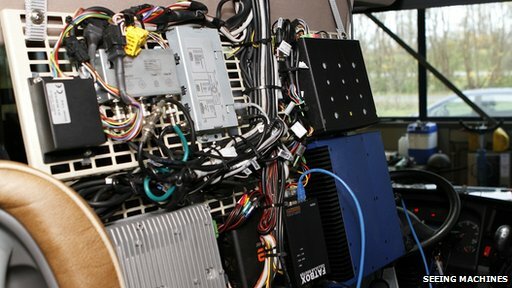 The Dutch firm has installed the tech on two of its vehicles and has recruited a further four coach firms to do likewise. Over the winter months the vehicles will travel from the Netherlands to ski resorts in Austria, Switzerland and Italy. Then, in the summer, they will travel to southern parts of France, Italy and Spain. "There are competitor products on the market and we evaluated a few of them," Royal Beuk's research manager Marc Beuk said. "But all of the others required something from the driver. One system required them to wear a special hat, another involved special glasses hooked up to wires. "This was the only device that we know of that didn't give the driver something to do - once he turns the ignition key the system boots up and it starts monitoring him." He added that if the nine-month test was a success, his firm intended to install the kit across its 60-vehicle fleet and act as its European distributor. Coach crashes In recent years driver fatigue has been blamed for several accidents. US investigators said it was a factor in a bus crash in which 15 passengers died in New York in 2011, as well as another similar incident which killed four people in Virginia last year. In the UK, a coroner cited it as the reason a coach veered off the M25 motorway near Slough, Berkshire, in 2003, resulting in the deaths of six people. However, one expert warned it was unclear exactly how common the problem was. "Crashes are very rare when measured per kilometre, nevertheless they do occur and some of these may be related to fatigue, although very little is known about the precise numbers," said Prof Pete Thomas, head of the Transport Safety Research Centre at Loughborough University. "The trial of a driver-fatigue detection system for coach drivers will provide useful further information to help improve coach safety, although it is important the trials are properly scientifically controlled. "Other factors such as speed and alcohol may also be important causes of coach crashes and bus operators should continue to reduce all types of risks." 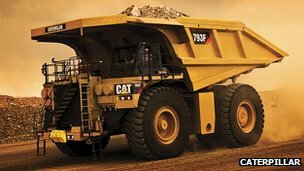 It currently costs the mining industry about £10,000 to install Seeing Machines' equipment in each vehicle on top of a continuing licence fee. But the firm said that if the trial was a success it intended to offer coach firms a "less rugged" version that would be about a quarter of the cost. It added it was also in early-stage talks to introduce its products to the airline industry.